This Self-Warming Lounge Sleeper is a restful retreat for your dog. Its made of a self-warming material that radiates heat back to your pet and that is very important for a smaller dog. It is machine washable and has a non-slip bottom for stability. That’s good for an older dog. It’s also green because the fill is made from recycled plastic bottles. The bed is perfect for small dogs and comes in two color combinations. This one is the Mocha/Green. The other is Gray/Blue. A self-warming bed can be perfect for any time of the year. It is soft and fluffy and warms up when Fido lays down! The self-warming lounge sleeper is the perfect comfort spot for a smaller dog. 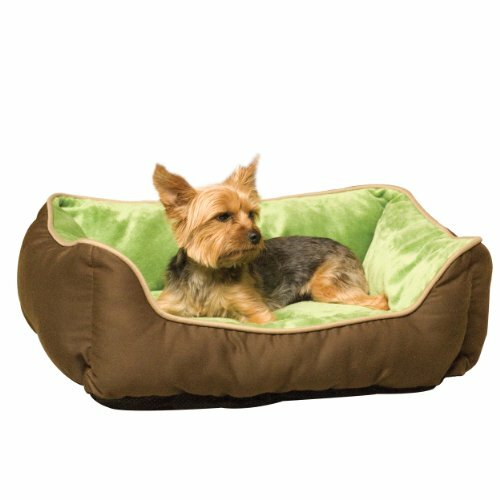 The exterior of this bed is made of a durable and attractive poly/cotton and it is lined with a plush micro-fleece your pet will love curling up in. The overstuffed bolster surrounding the bed perfectly works well with the soft, pillow-like sleeping surface. This self-warming bed has a layer of metalized insulation that radiates warmth generated from the pets own body heat. The bottom of the bed has a layer of stay put non-slip fabric. This version of the self-warming lounge sleeper is available in one size and two colors combinations. An additional version of this great bed is available in two size/color combos.